Some may find Norah Jones a little like musical ether, but not me, big fan here! As far as I'm concerned, she possesses one of the smoothest vocal tones of all the Divas currently in operation, and it never ceases to beguile me with its quiet beauty. Yet, no vocal profile...naughty me. Performing at the annual Itunes Festival, the musician put on an accomplished but relaxed set; delving into new record Little Broken Hearts as well as singing fan favourites like What Am I To You and- one of my favourites-Carnival Town. 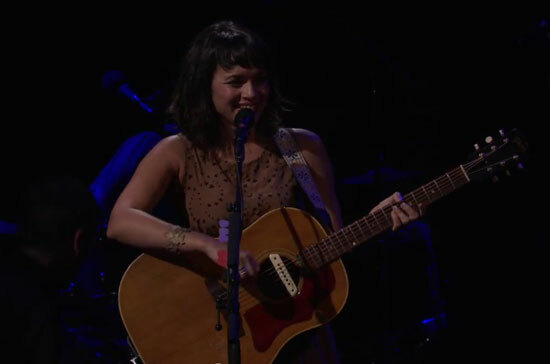 Norah Jones is one Diva that I need to see in concert, ASAP! You can watch P!nk's performance at the Itunes Festival, here. Norah is awesome. But I am not fond of her last two albums. It is beyond me why she messes electronically with a voice like that. Much prefer her earlier stuff and that with The Little Willies. And I agree, naughty you for no profile yet. Diva, you can slap me later. However, are you gonna do a vocal range for Elle Varner or at least a album review of her debut album Perfectly Imperfect, where you touch on her vocals? & I was still waiting for you to update Monica's vocal profile. lol. I think her album has been out too long to review now- though I love it. But she will get a profile. Monica I'll try getting round to next week!